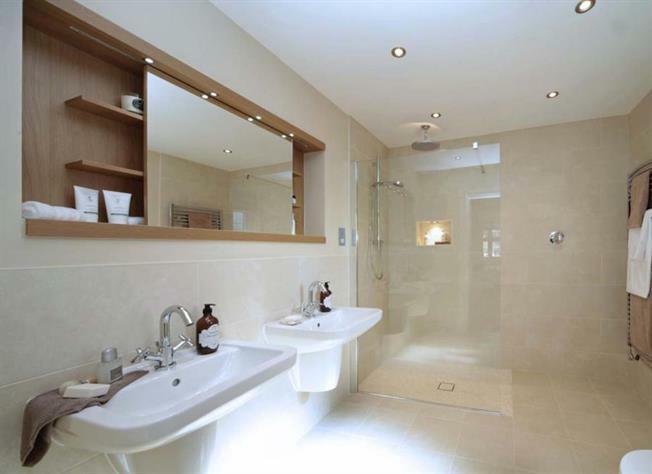 5 Bedroom House For Sale in Woking for £999,950. The ground floor offers a lovely open entrance hallway which leads to the bay fronted sitting room to one side, the dining room which could also be used as a study to the other and then opening to the sumptuous open plan kitchen/breakfast/family area to the rear. With feature double glazed doors opening onto the garden this property is ideal for family life. The ground floor also offers a separate utility/boot room with access to the side of the property, under stairs cupboard and a cloak room. As with the ground floor, the impressive first floor gallery landing sets the standard and provides the space for an arm chair and desk or small sofa in the bay window to relax in and also guides to the 5 bedrooms, two with en-suites and a stylish and contemporary 3 piece family bathroom. The master bedroom is the piece de resistance, a generous bay fronted double bedroom boasting a walk in dressing room which then leads you into the fantastic en-suite bathroom. Bedroom 2, as with the master bedroom, also benefits from a feature bay window and an en-suite and there are still three further double bedrooms and a family bedroom to offer. Bedroom 2: 13'0" x 10'5"
Bedroom 3: 15'9" x 8'9"
Bedroom 4: 12'7" x 8'6"
Bedroom 5: 12'4" x 8'6"